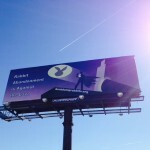 The first billboard from the dontdumprabbits.org CrowdRise campaign is up in LAS VEGAS!! It is 14×48 feet in a great location near the convention center on Desert Inn & Valley View. It’s bold graphics sends a powerful message about rabbit abandonment. Thank you to all that worked hard on this, including Maria Perez chapter manager of the LV House Rabbit Society and for the (wants to remain un-named), talented artist that took my ideas and created a bold, dramatic image, and of course Victor Gutschalk for all the computer tech support. This message to help rabbits would not have been possible without your donations and good wishes. More billboards to come and thank you for your continued support. 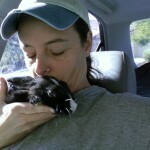 Faith Maloney, co-founder of Best Friends Animal Society, writes about the first big Nevada rabbit rescue in 1996. “I didn’t know you could spay and neuter them” was her reply. She had been a show girl at one of the big casinos back in the day. Photos of Dean Martin and Frank Sinatra were on her walls. But now she needed a walker after having had a hip replacement surgery. So her ability to take care of the rabbits was severely limited. And she wanted our help. It was time for her to surrender the rabbits before the situation got any worse. I decided there was no point getting all worked up about the lack of spaying and neutering. Too late now. We had a big problem to deal with so it was time to make a plan. The lady had hired Oscar, a young man originally from South America, to help around the house and yard. Oscar was a very intelligent, inventive, and caring man. And he was to become our strongest ally in catching all the rabbits and getting them transported to the Sanctuary. Turns out the rabbits we could see running around the yard were but a fraction of the total. There were as many below ground in a complex warren system as there were on the surface. And there were multiple generations in residence all stemming from an original three or four rabbits the lady had acquired. Catching them all was going to be a challenge as most of them were not used to being handled so did look upon us as their saviors but rather as their enemies. And we knew it was not going to happen all in one day. This might take days or even weeks to get them all. Oscar told us that every evening he collected left over vegetables and bread from local grocery stores and fed this to the rabbits at around 8 am the next day. Armed with this knowledge we hatched a plan. We would return before feeding time the following day with a van and as many pet carriers as we could round up. One of the team was designated as the rabbit “sexer”, meaning it was her job to sort out the boys from the girls. The carriers would get a sticker stating the gender of the occupant so we could put a stop to the breeding right then and there. Oscar had prepared bundles of chicken wire that he would use to block the warrens to stop them going back underground once they surfaced. We were all in position when Oscar brought out the food. Chaos ensued. The rabbits began emerging from warrens all over the yard eager for their meal. We started swooping them up, handing them to the sexer and then putting them in the carriers with their boy or girl sticker and some food as well as we had denied some of them their breakfast. We did manage to catch and load around 80 rabbits that first day for transport. As soon as we drove off Oscar removed the chicken wire balls blocking the warrens so the rabbits could have free access to above and below ground. He also agreed to build a secure holding pen above ground with cardboard shelters for the rabbits to hide in. Every day he would repeat the same process as we did on day one. And every few days we would drive back down to Las Vegas and load up the rabbits from the holding pens until Oscar had got them all. It did take a few weeks, but we transferred a total of 178 rabbits from that small front yard. 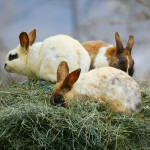 The moral of this story is that three or four rabbits can make a lot of new ones if not spayed or neutered. An excellent article from the Richmond, B.C., Canada News, so well researched, very inclusive and with just the right tone. (Although they didn’t open the huge can of worms about how difficult it is to rescue rabbits given the current laws and policies in BC. But the story was about abandonment more than rescue). Great reporting job! This year, 2016, is the tenth anniversary of the Reno, NV. 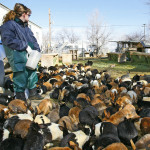 rabbit rescue in 2006. I have asked several people to write about their experiences of working with and love for this extraordinary group of rabbits of over a thousand in number. If you are one of those that gave your time and heart to these rabbits I would love to read and post your story. Contact me: Debby. 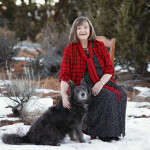 Lucile C. Moore, PhD is writing the third edition of her book, Rabbit Nutrition and Nutritional Healing. This newest edition will be available by the end of this year. 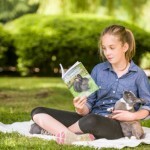 She has asked me to write a short article on feeding colony rabbits. In addition, she has written a companion piece on this subject as well: Nutrition for Outdoor Colonies of Community Rabbits. Both will appear in the third edition of the book. 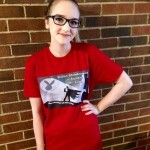 She has given me permission to post these on the dontdumprabbits.org website! Thank you Lucile for the well researched, valuable information on a subject that needs to be shared.